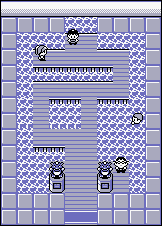 After you enter Cerulean City for the first time, you will be trapped until you defeat Misty in the local Pokémon Gym and your rival at the entrance to Route 24. If you need to build up your Pokémon before taking them on, fight wild Pokémon in the patch west of the city and rejuvenate them at the Pokémon Center. Then earn your Cascade Badge at the Gym and head up Route 24. As you explore Cerulean City, you'll spy someone beyond the fence on the northwest side of town. You won't be able to reach him until you're near the end of your adventure, so don't worry about him. Just take care of Misty and your rival and prepare for the greater challenges ahead! Some mysterious crimes are afoot in Cerulean, but you can't enter the northeastern house when you first see it. A policeman is guarding the front door, as Team Rocket has robbed it. After you visit the Sea Cottage up north, you'll be able to enter this building and exit through a back way that leads to several routes out of Cerulean City. You can check out the Bike Shop (lower-left building), but their bikes seem a tad pricey (a million bucks for a bike? But your money counter stops at 999,999!). You can get a better deal in the building to the north, although the deal you'll get differs depending on which version you're playing: if you have Red or Blue, you can trade a common Poliwhirl for a one-of-a-kind Jynx. If you're playing Yellow, you can't get the Jynx, but the girl will give you a Lv. 10 Bulbasaur if you can prove that you've taken good care of your Pikachu. You don't have to have beaten Misty to obtain it though. So check out your Pikachu: if it's in a good mood, with ears wagging or with little hearts, the Bulbasaur is yours. If not, you'll need to use Pikachu more and level it up a few times, or You need to attempt to give him a potion when he has full health; the more you do it, the happier he will get , and the Bulbasaur is yours. 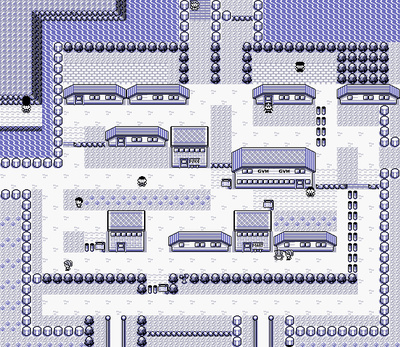 If you try to leave town to the north, you'll have to confront your rival, but you may want to fight him and the trainers on the bridge (on Route #24) to build some EXP before you fight Misty. Finally, there is a Rare Candy located in the backyard area of the northwest house. It is three spaces west and one space south of the northeastern-most movable space. This Gym consists of one Junior Trainer and one Swimmer, as well as the leader, Misty. If you feel you can do without the EXP, you can walk wide around the first one. You should probably just partake in the extra battle, though, as you won't be able to do it later. All of the Pokémon are Water-type. The two junior trainers aren't too tough, but Misty's Staryu and Starmie are dangerous. Pikachu, unfortunately, can't really handle them (unless it's at a high enough level). Thundershock just doesn't have the power to defeat them before their STAB Water-type attacks take out the cute yellow mouse. The exception to this is the Pokémon Yellow Pikachu, which if you took time to leveled it up to level 26, it should be able to learn the very powerful Thunderbolt at such an early stage of the game. This should be sufficient to K.O. them quickly enough. A good strategy in Yellow Version is to use Double Team repeatedly, followed by Thunder Wave. The combination of your raised evasion and the enemy's paralysis makes it extremely unlikely that your Pikachu will take enough damage to be KO'd. Then you can just hit them with your most powerful electric attack. Bulbasaur, which should be Ivysaur by now, won't even break a sweat taking them down. Wartortle is walled by her Pokémon since they're both the same type but it should do decent if it has Mega Punch (by TM01 from Mt. Moon) or Bite (learns at level 24). If your starter was Charmander, forget about it. Instead, go north of Cerulean to capture a Grass Pokémon like Bellsprout or Oddish, and get it to at least level 17. The Cascade Badge and TM11 (Bubblebeam) are your prizes when you win. Bubblebeam is a 65 base power Water-type move. It's a step up from Water Gun, to be sure, and you don't have to worry about wasting it if you don't plan on making a competitive Persian — the much more powerful Surf makes it obsolete later on. The Cascade Badge will make traded Pokémon up to level 30 obey you, as well as permit the out-of-battle effect Cut to be used. Jynx, possibly the strangest of Pokémon, having a unique combination of types: Ice and Psychic. She has good Speed and Special, but her Attack is mediocre and her Defense is terrible, especially since Ice is the worst defensive type in the game. She's the only Ice-type you can get for a while, and she has more Ice-type attacks then some of its brethren, but there are better options later on and she gets no Psychic-type moves at all (unless you use a TM.) A good choice, but you could do better. Try and make sure that the Poliwhirl you trade is under level 39, or else your Jynx will lack the sleep-inducing Lovely Kiss attack. Yellow players can finally receive a Bulbasaur here if their Pikachu is happy with them. It's a little low level, being only level 10, but it comes with Leech Seed already and will learn Vine Whip by level 13. Probably the best Grass-type in the game, although Oddish and particularly Bellsprout are close. It should certainly be helpful against Misty. This page was last edited on 16 January 2017, at 20:48. This page has been accessed 1,125,012 times.